NeutralPure ECO Tabletop Terrariums: Affordable and DIY Planting Makes Easy! 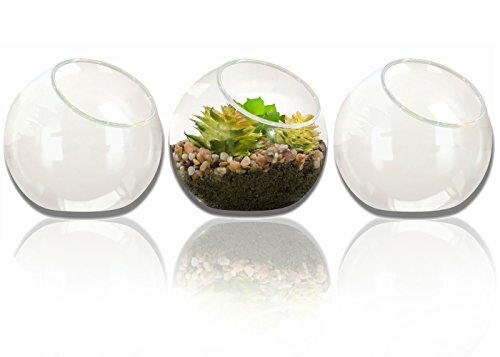 NeutralPure ECO 3 piece terrarium set is catered for those who appreciate the art of DIY indoor and outdoor planting. Housed in a glass vessel, NP399GT terrarium set offers a quirky twist on traditional indoor and outdoor plants. Perfect for those who prefer small space decoration and hassle free care taking of the plants. The compact and see through design of this glass terrarium allow apartment dwellers to bring some of the wellness-boosting benefits of nature into their interior decor, making your home more welcoming, lively, sweet and charming. * All Season Friendly: You can always enjoy your indoor plant regardless sunny, rainy or even snowy day. Terrariums are all season friendly if maintenance properly. * Low Maintenance: Terrarium plants require minimum watering and care once established. Ideal for lazy gardeners and busy executives. * Space Savings: NP399GT is compact and easy to display and store either indoor or outdoor. Ideal for small plants lover and weekend gardeners. * The Green Factor: NeutralPure ECO terranium set is build with high quality see-through borosilicate glass. You can easily add the "zen" elements to your home decor. Terrarium planting can survive through four seasons - Spring, Summer, Fall and Winter. If you spending too much time in worrying whether your flowers or plants will last though the seasons, then why not considering getting into the habit of terrarium planting. Forget about spending countless money on landscaping and heavy gardening, invest in a reliable terrarium set is all you need. Don't wait - Be hassle free and add more green elements to your house decor or office desk right away! ➤ DIY GARDENING DECOR: Promote green and space saving; Suitable for planting succulents, cactus and small flowers with little watering needed. ➤ VERSATILE AND MULTIPURPOSE: Ideal for green house and microlandschaft decoration, fairy garden and DIY design; Soil, Sand, rocks, pebbles and acrylic deco friendly. ➤ ELEGANT AND PERFECT SIZE: Easy to plant and pretty much maintenance free. Product dimension: 3.92"(L)*3.5"(H)*3.92"(W) and weigts only 1.76 oz. Mouth dimension: 2.5"
➤ LIFETIME WARRANTY: NP399GT makes an deal gardening gift set for friends, families and your loved ones. This premium glass terrarium comes with a lifetime warranty with proof of purchase ONLY directly from NeutralPure ECO. If you have any questions about this product by NeutralPure ECO, contact us by completing and submitting the form below. If you are looking for a specif part number, please include it with your message.